If a website or a service where you have an account has been hacked, criminals may have gained access to your personal data, such as email credentials, phone number, bank card details, information about your transactions, your ID, and so on. If you use the same user account and password for different sites, it is more likely that your data will be leaked. 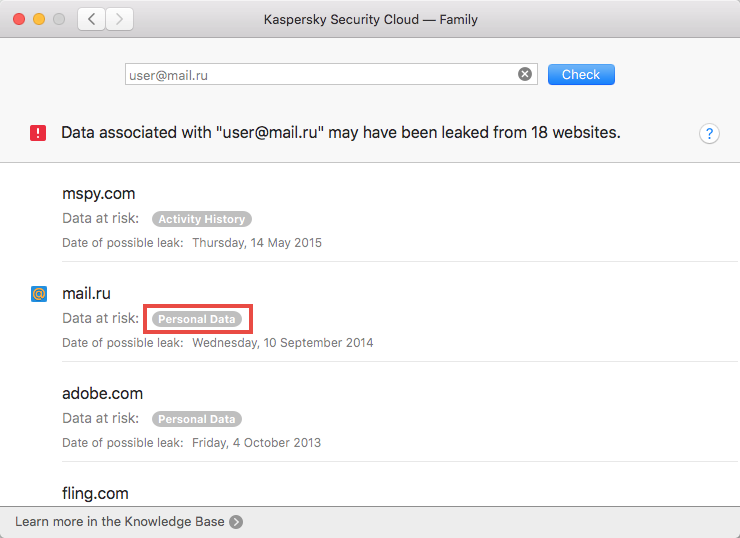 With Kaspersky Security Cloud for Mac, you can check the probability of data leakage. 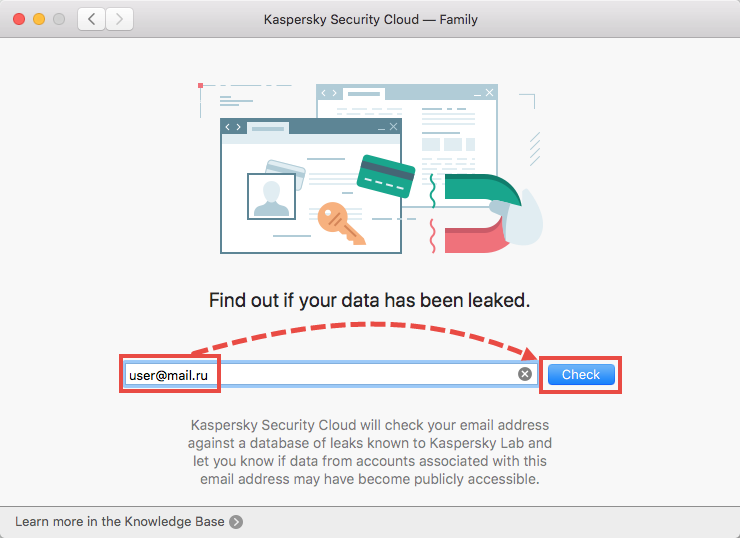 When Account Check is used, Kaspersky Lab does not receive data in an openly-accessible format, and does not store it. The data is only used for scanning. 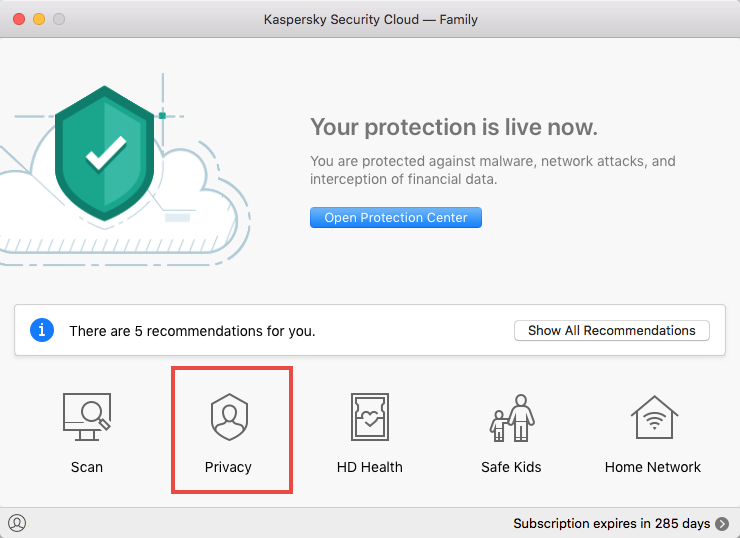 On detecting a leak, Kaspersky Security Cloud for Mac does not gain access to the user data itself, but only provides information about categories of data that may be publicly accessible. The accounts are checked using the database of the Have i been pwned website, which is regularly updated. Your account name when you sign in to websites. When you sign in, your account name is sent encrypted to KSN, where further scans are performed. The email address and password for your My Kaspersky account. The first check takes place two days after you install the application. From then on, a check is performed every 24 hours. You can run Account Check manually. A list of websites from which a data leak could have occurred. The date of possible leakage. The category of data that may be publicly accessible. Click a data category link to learn how to minimize the consequences of a possible leak of this data. Enter the email address you want to check, and click Check. 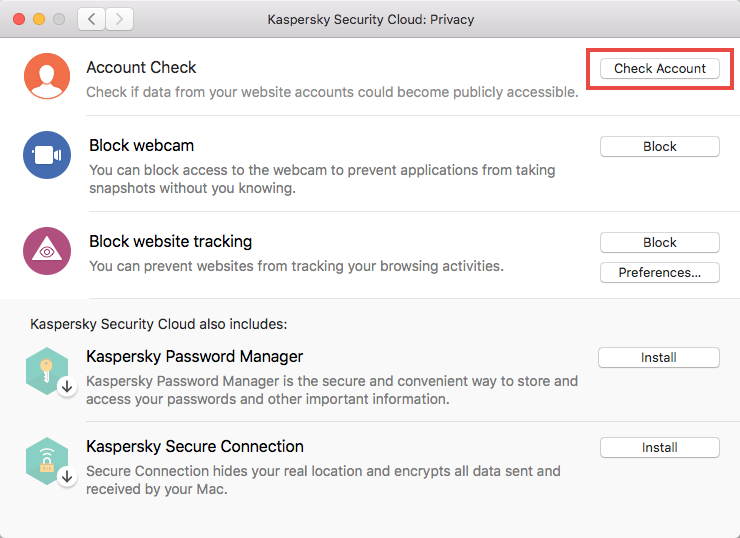 Kaspersky Security Cloud for Mac will begin scanning.